This is a great videos on the online Guardian newspaper. with a great guide of Ms. Rie Yoshitake of Sake Samurai UK. Their first destination is to Kyoto, the old imperial city of Japan. Masuda Tokubei Shoten, the brewery of "Tsuki no Katsura" sake. Then the trip continues in Kanazawa, Ishikawa prefecture. 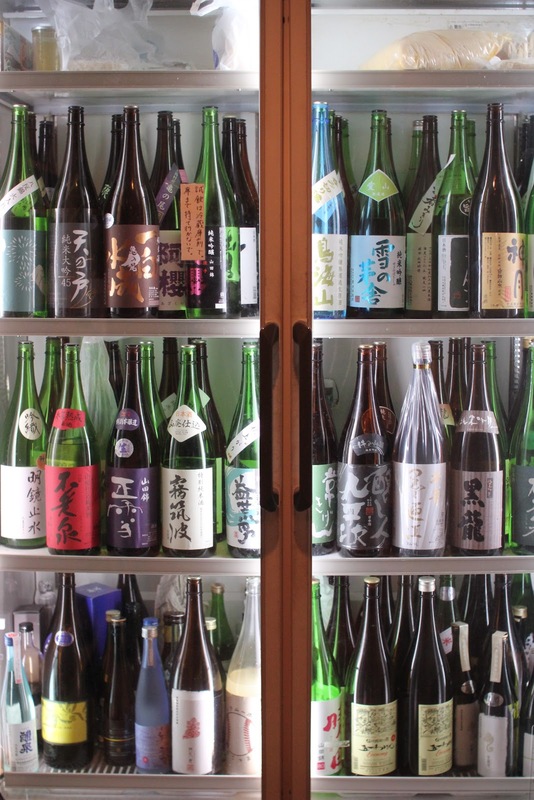 introduce the art and history of Sake. Then the last destination; Miyagi. Mr. Saura of Urakasumi Brewery and beautiful oysters in Matsushima bay welcomed them. These footage was taken 3 weeks before the earthquake in Japan on March 11th. And became a tribute to all the people in Japan. You are our nature that nourishes us. And you are our history that sings the same song for generation to generation. You showed us the light and pride in any hardship in our history. Sake, you are more than a drink. Get together with NEXT5 after the tour! I came with Tamiya san before. I don't know which to choose...out of sake from NEXT5 breweries. within pesticide-free, chemical fertilizer-free environment. I do not remember anything around this point. third place. we finished pizza and red wine. what a fun night. that's all I remembered. or that's all I could see from this photo. um. On my way home, I was nodding to the reason of NEXT5's popularity. and It is about their free & open-mind spirit that leads new ideas and directions. First, let me bring EMOTION 2011 to London! And finally we are at Yuki no Bijin in Akita city! Akita Jozo locates on the first floor of a big apartment complex. Nobody would realize there is Sake producing inside of this building! for larger breweries (it was very common back then, called "Oke-Uri") till 10-11 years ago. 660 square meter sized brewery on the first floor. less than 800 kg, common in Daiginjo making. make it possible to brew Sake throughout the year. stars from each Tohoku prefecture and Keisuke Kuwata, the biggest musician in Japan. and made me want to listen his stories and thought all day long. This is very compact rice steamer. It looks like a Japanese Bento-bako (lunch box). Still you can steam 45kg of rice at once. instead of using high brand Sake rice Yamadanishiki. not too tangled by terrior philosophy, buying the rice from anywhere in Japan if good Sake rice. without relying on name recognition of the Chianti region or D.O.C. laws. "I rather take seriously about the balance between being 'real' and being 'delicious'." already one and a half hour had passed then. I wish he is my collage professor. He mainly uses Yamadanishiki, and Aiyama and Omachi for most of the Koji rice. Dewa no Sato from Yamagata, and Hattannishiki of Hiroshima prefecture. He uses 100% Futa-koji for koji-making. This is day 8 Moromi mash of Yamadanishiki and Sakekomachi rice, using Kanazawa yeast. with the help of super soft water from Iwami Sannai region. Another aspect of Yuki no Bijin sake is that only one fourth of their Sake is pasteurized. Mostly Nama-zake (un-pasteurized), and they produce Sake throughout the year. that means: we can drink Nama-zake all year long! more of the unknown elements like University of Bordeaux." after the certain length of time and the one does not lose the quality. I got to have lunch after this and really enjoyed Mr. Kobayashi's world. Finally, off to Aramasa, the last destination of Next5 tour! This is Yamamoto Gomei Co., the brewer of Shirataki. UNESCO World Heritage Site in 1993. Today the brewery produces 820 Koku (82,000 magnum bottles) per year. "Executive director, Grower and Brewer"
His Sake production takes the most advantage of its abundant natural resources. and this super-soft spring water is used for all part of the Sake-making. easier to make Sake in the best drinking condition. He rented 1,287 square meter of terraced rice fields in the area and produces rice. The same spring water I explained above is also used for rice making. 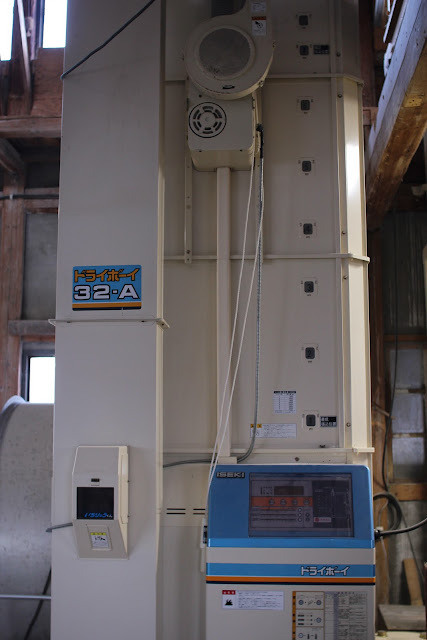 the photo above is rice thrashing machine. 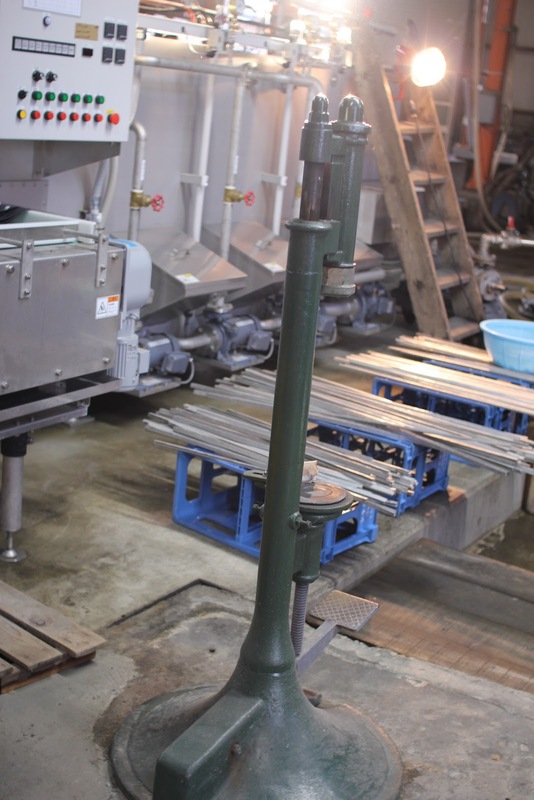 I've seen rice thrashing or polishing machines in Sake breweries but never the drier. to prevent cracking rice when polishing and washing rice. in three different stages. The water amount in rice drops from 22-25% to less than 15%. for his organic rice crops, without any pesticide or chemical fertilizer. The half of rice he produces is organic. The MJP rice washing machine, same as Harukasumi! It washes rice so softly with the cushion of bubbles. used for Koji rice. Rice steamer also wears Shirataki brand. The Beatles. Mr. Yamamoto's favorite band. Their music is playing 24 hour in the brewery and I found their posters all over. throughout the whole year. "I want everyone to 'enjoy' their work" says Mr. Yamamoto. so that you can measure the weight of rice. and I found one in his Koji room as well. there are pipes above tanks running 3 degree water. and green ones in the back is for Junmai Ginjo and Daiginjo class, 600-800kg in size. My first time to see the tool to close magnum bottle caps. to manage artists like Risa Ono and THE BOOM. and used his experiences in different back ground and his creativity to rebuild the Shirataki brand. 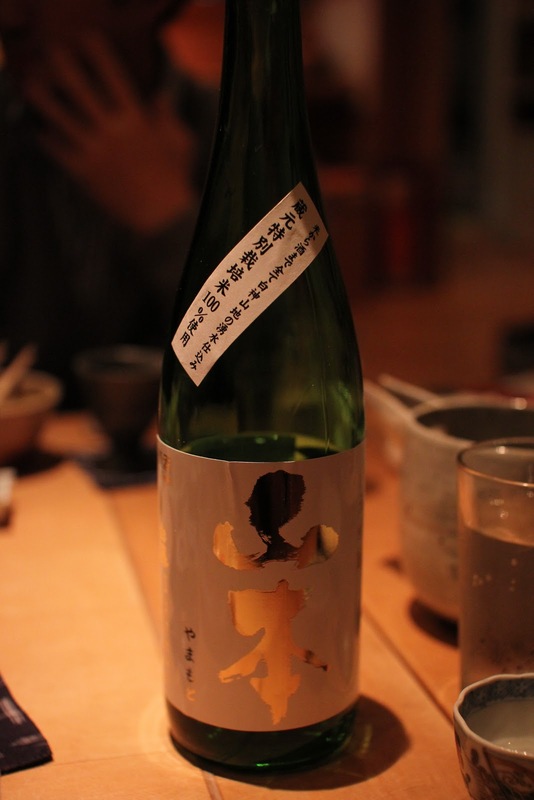 For example, he created a un-pasteurized Nigori (= cloudy) Sake named "Do"
still have sell some products in January. So he just filtered still fermenting Moromi mush with strainer and bottled without pasteurization. and he received enormous amount of complains from the customers. made it to the super popular brand. Yes, Mr. Yamamoto's new home! How wonderful view. I saw the moon poking its face from the mountain behind the house. his children's study table are sent outside of individual rooms. He told me he designed his house "as less individual space as possible". The warm woody house was filled with his family's lively voice. Thank you Mr. Yamamoto to welcome me on my sudden visit!